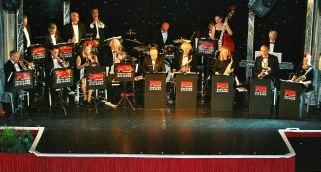 The Pavilion Big Band, based in Norwich, was formed in 1998 by Chris Wicks with a few friends to promote the music of Glenn Miller, the Rat Pack and other swing/latin standards. In the early days the un-named band used the facilities of the Pavilion at Sprowston for rehearsal and soon they became known as the "Pavilion Big Band", which seemed the obvious name to adopt. The first piece of music performed in public was "My Funny Valentine" at a gig on 17th October 1998 at the Oasis Leisure Centre, Norwich. Over the last 20 years, we've played for many weddings, parties, 1940s style dances, ballroom dancing, concerts, theatre shows and fetes as well as for many private engagements. We marked our 20th anniversary in October 2018 in superb style with a 40s dance which was then broadcast on BBC Radio. The band now rehearses on a Thursday at Cringleford Sports Pavilion, Norwich NR4 6XF and we are delighted to say that our founder member, Chris, is still playing trumpet in the band, 21 years on!